An altimeter (fig. 4-11), like a compass, provides one simple piece of information that forms the basis for a tremendous amount of vital detail. The compass merely points the direction to magnetic north. The altimeter merely gives the elevation. But by monitoring the elevation and checking it against the topographic map, mountaineers keep track of their progress, pinpoint their location, and find the way to critical junctions in the route. Every climbing party should have an altimeter. 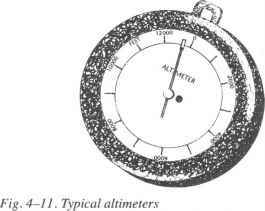 An altimeter is basically a modified barometer. A barometer measures air pressure (the weight of air) and displays it on a scale calibrated in inches or millimeters of mercury, or in millibars. Because air pressure decreases at a uniform rate with increasing altitude, a barometer can measure elevation if it is fitted with a scale calibrated in feet or meters instead of units of pressure. angle. Tap it lightly several times to overcome slight friction in the mechanism, and then take an average of several readings. The elevations determined by an altimeter are only approximate because the instrument is strongly affected by variations in temperature and weather. Check the reading whenever you reach a point of known elevation so you can reset it if necessary.